the Surface Book is the first of a new line of laptops from Microsoft with a twist, the screen comes off. Microsoft’s Surface Pro line started off clunky: big, heavy and rather industrial in design. The latest Surface Pro 4 is thinner and more capable, but pretty much the same: a Windows 10 tablet with a removable keyboard. Sales of PCs - desktop computers and laptops - have been in decline for years. The PC market suffered in 2015, falling 10.6 per cent compared to the previous year, as consumers hang on to their devices for longer and increasingly turn to tablets and larger-screened smartphones. The screen and keyboard are connected by a fancy Fulcrum hinge that rolls out instead of just pivoting. It extends the length of the base of the keyboard to better balance the screen, without having to add weight. It looks weird, almost cool, and in practice works well. It doesn’t tilt quite as far back as some other laptops, but far enough for comfortable viewing at a desk. The keyboard and screen are made from a grey magnesium alloy, which looks and feels nice, but marks quite easily. In my short time with the Surface Book I’ve noticed scratches on the underside of the keyboard and a mark on the lip despite looking after it carefully. When shut, the hinge does not fold flat, instead it has a gap about a finger’s width creating a wedge shape that tapers from 22.8mm to a point of 13mm thick. The Surface Book is more than able to handle multiple tasks thanks to an Intel Core i5 processor and 8GB of memory on the starting model, which costs £1,299. We got our hands on the top-of-the-range model, which has 16GB of RAM, an Intel Core i7 processor and 512GB of storage space, costing a whooping £2,249. The Surface Book is pretty stunning on first look too, with its silver coloured magnesium body and huge 13.5-inch screen. However, the downside is it is quite weighty at 3.48lb and therefore a bit of a beast to carry around. This particular model also includes a NVIDIA GeForce Graphics Processor, which makes it perfect for gamers – but be warned, it’s only installed in the keyboard base so you won’t be able to make use of it when the screen is attached. Speaking of the screen, it’s particularly gorgeous with a market-leading 3000x2000 resolution with 267ppi, which provides sharp, clear and crisp images perfect for viewing photos or watching a movie online. 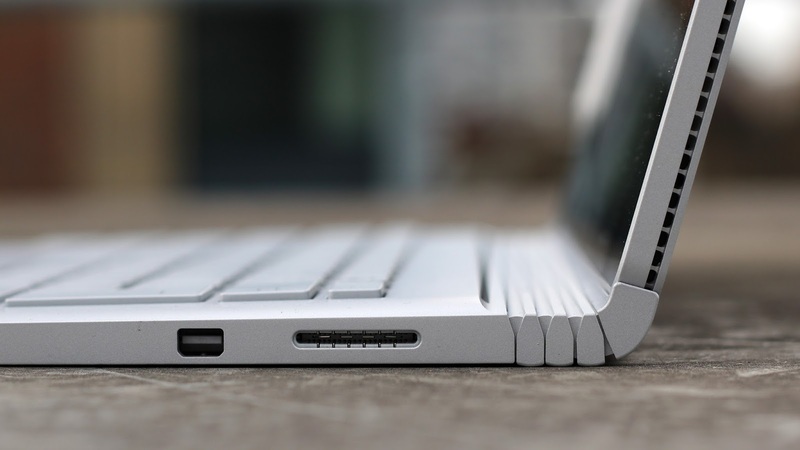 There are two USB 3.0 ports on the Surface Book, as well as an SD card reader and Bluetooth connectivity. Not one but two cameras can also be found on the device – a 5-megapixel 1080p HD camera on the front which you can use to log on using Windows Hello, and an 8-megapixel snapper on the back. There are two batteries on the Surface Book – one in the screen part and one in the keyboard part. Microsoft claims that the top half provides three hours of battery life, while the second battery found in the keyboard section pushes it up to 12 hours in total. These times will vary, as you can expect the battery to drain much quicker if you’re running multiple tasks. We’ll let you know how we got on with battery life in our second piece. And why does the Surface Book have to separate batteries? Well, so that you can take the screen off and use it like a tablet. When you want a standard PC experience in laptop form, you get more juice via the keyboard element. The Surface Book hinge is a big differentiator to the Surface Pro tablets. First off, the keyboard is an essential part of what the Surface Book is with some of the essential computing components tucked inside (the Surface Pro’s Touch Cover is sold separately and is literally just a keyboard, nothing else). One of those components is the graphics unit, meaning if you’re running Photoshop or Microsoft’s free software Fresh Paint, you won’t be able remove the keyboard until you close the program. As the keyboard is crucial to the Surface Book it fuses with the screen and you have to press a special button that releases the screen from the hinge safely. Once the screen is off, tap the tablet mode icon in the action center and you can use it like a tablet. The hinge doesn’t rotate a full 360 degrees as you might expect though. It opens and folds to the amount that you’d expect a normal laptop to. However, flip the keyboard around and it makes a decent tablet stand. Yes, like Surface Pros, you get a Surface Pen with the Surface Book which works with the touch screen. The Pen is always a nice alternative to your fingers, as it’s able to touch smaller buttons but can also be used for writing on the screen and even painting with the Fresh Paint app. It’s especially useful for note taking with OneNote, and the clickable eraser top even opens OneNote instantly for you. The pen features an AAAA battery which Microsoft claims can last up to 18 months before the pen senses when it’s not in use and stops using power.